Hallo and welcome to my Teysa Karlov EDH deck. This deck is based around the first ability of Teysa to take advantage of effects which are triggerd whenever a creature dies. There are three main packages in this deck. Tokens: You want to be able to produce tokens consistently because you need them to as sacrifice fooder. And tokens synergize with the second ability of Teysa which can be handy. Sacrifice: You need sacoutlets to take advantage from the death triggered abilities of your permanents at any time you want. Death triggers: To get the most out of Teysa you want to have permanents which want creatures to die. The "Reveillark Combo" is Reveillark infinitely reanimating Karmic Guide which then with Guide infinitely reanimates Reveillark giving you infinite ETB or die abilities of one or more 2 or less power creatures. It can be done here by adding a sac outlet to continually sac both Guide and Lark. 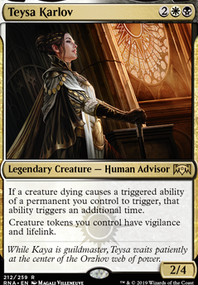 Since Lark's leaves the battlefield trigger is considered a die trigger then with Teysa also in play you can reanimate four creatures with power 2 or less each time Reveillark leaves the battlefield. This is not needed for the combo, but can be a ETB/die value engine. Ashnod's Altar : creates infinite colorless mana. Phyrexian Altar : creates infinite colored mana. Viscera Seer : let you scry whatever you want on top of your library. Carrion Feeder : it gets any amount of +1/+1 counters on it. Other good sacoutlets for this combo which are not in this deck: Altar of Dementia , Blasting Station . Blood Artist , Falkenrath Noble , Zulaport Cutthroat : With infinite death triggers you will kill all your opponents. Deathgreeter : you get infinite life. Grim Haruspex , Harvester of Souls , Midnight Reaper : You can draw your whole deck. and with Phyrexian Altar out you are able to play your whole deck. Midnight Reaper is the worst card out of these 3 to do that because you need a way to get enough life to draw that many cards with him. Requiem Angel : will give you a infinite amount of spirit tokens. Nim Deathmantle is a very good card in this deck because it allows you to get back every creature you want if you sacrificed it. The best sacoutlet with Nim Deathmantle is Ashnod's Altar because it pays for of the mana by sacrificing the creature with it. Kokusho, the Evening Star : This is my favorite card in combination with Nim Deathmantle. If you have Ashnods Altar and Teysa Karlov out you propably only need to kill every opponent and gain a lot of life. Sun Titan , Karmic Guide : You can sac one of those creatures and bring it back with Nim Deathmantle to reanimate another creature in your graveyard. Hallowed Spiritkeeper : You can produce a lot of Tokens with Hallowed Spriritkeeper if you sac it then bringt it back with Nim Deathmantle and sac it again and so on and so on. Archon of Justice : You can exile a lot of permanents with this card combination. What is the main challange of this deck? To get the deck going you must have a lot of pieces on the board. First you need something to produce token. Then you need a sacoutlet and something that triggers whenever a creature dies. Because you need at least three pieces the deck is easy to interrupt. The mana base is still work in progress. Suggestions and Upvotes are appreciated!